My staff brought in a take-out order menus that was being distributed out on the streets and excitedly pointed out to me the availability of my hometown food. As far as I am concerned, my idea of Singapore beef noodle is the Odeon Beef Noodle type, which was very popular at Scotts Pinic food court back in the 80s and 90s. It was the one with the thick yummy gravy. The one shown in the pamphlet looked nothing like it. However, my curiosity got the better of me and I decided to order one to check it out. 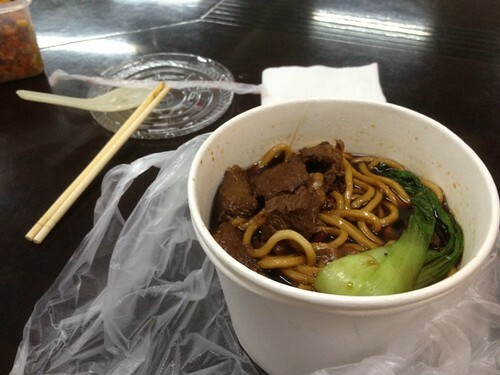 The noodle was not the thick rice noodle that we usually get in the Odeon Beef Noodle version. 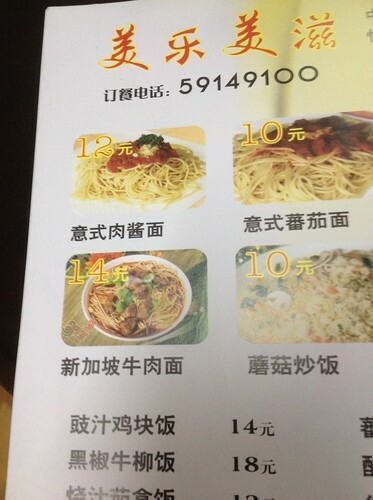 It was more like dark yellow noodles that you find in Malaysian Hokkien Mee. The thick black soup was quite tasty and it reminded me of the 砂锅当归羊肉汤 (Claypot Mutton Soup with Dang Gui), that you can find at Alexander Village hawker centre, except that it uses beef here instead of mutton. The dang gui taste, aka angelica, is rather rich in the soup. Anyway, I think it's a sham to be calling it "Singapore Beef Noodle" when I have never tasted anything like this anywhere in Singapore in my life. Still, it was quite a tasty noodle and I don't mind eating it again. Arrenn: I love mee kuah albeit sibeh messy to eat. naeboo: like how Hainanese Chicken Rice isn't exactly from Hainan. On a separate note, Mee Bandung... hmm.... mee with rose syrup and milk.... hmmm....eek. haha. Ash: To be honest, it's not bad. Just can't get over the fact that they took the name Singapore in vain. That's all. Other than that, I don't have a beef with them.